Considered the world’s most delicious snack, macadamia nuts are flavorful and packed with nutrients. These are small and crispy and have a buttery flavor concealed by a very hard kernel. Originally from Australia, macadamia nuts are an important part of Aboriginals’ diets because they are rich in vitamins and minerals. Macadamia trees have been cultivated for more than a century now and different farmers have come up with different varieties. Since they are 100 percent cholesterol-free, macadamia nuts are perfect for those who have heart conditions (or who want to avoid them). These nuts can reduce cholesterol levels and clear the arteries. making you less susceptible to coronary diseases. Macadamia’s phosphorus content is beneficial for the teeth and bones. It can improve mineralization, metabolism, absorption, and transport of nutrients. Similarly, the calcium found these nuts aids in keeping the bones and teeth healthy. By eating macadamia nuts regularly, you should be able to help the body deposit new bone tissue, helping keep the skeleton strong as you age. Omega-3 also prevents the occurrence of osteoporosis and provides relief for arthritis. These nuts can also be useful for constipation and other related diseases because they contain an estimated seven percent of dietary fiber that are made up of complex carbohydrates that help in digestion, promoting satiety, and minimizing constipation. Your chances of avoiding health problems like cardiovascular disease, arthritis, and cancer are higher when you have enough amount of essential omega fatty acids, which can be found in macadamia nuts. These fatty acids help promote balance in your cholesterol levels. In addition, the high antioxidant content of macadamia nut oil, like vitamin E and squalene, eliminates free radicals in the body. By neutralizing free radicals, these antioxidants help prevent life-threatening diseases like breast, prostate, gastrointestinal, lung, stomach and cervical cancer. Linoleic acid is one more nutrient found in these nuts that can help you prevent trans-epidermal water loss (TEWL), a skin condition where water loss can lead to drying, scaling, and roughness. Nuts have been known to be great brain food because they help improve cognitive functions. The copper found in macadamia nuts are good for the brain’s neurotransmitters or the chemicals that send information throughout the brain and body. Oleic acid is integral to boosting memory power. With regular intake, you won’t just stay mentally sharp, you can also look good. Macadamia nuts contain nutrients that are great for the hair and skin. These have high levels of palmitoleic fatty acids that delay cell aging and promote proper hydration. Macadamia nut oil is also proven to strengthen hair. These aren’t the only organs macadamia nut oil helps keep strong. They are essential in promoting the health of our body’s building blocks: cells. Magnesium found in macadamia nuts support muscle and nerve functions. It also helps stabilize heart rhythm. The minerals and vitamins found in these nuts are known to be helpful in regulating the body’s fluid balance and immune system. These are useful in maintaining healthy skin and boosting the nervous system. Moreover, the dietary fiber help reduce constipation and provide relief from digestive problems like irritable bowel syndrome and slow digestion. You can enjoy macadamia nuts as is or paired with white chocolate. They taste great when roasted or ground into nut butter but there are other deliciously creative ways to consume macadamia nuts, such as pies, cookies, biscotti, or macaroons. They also taste good when tossed into salads or made into chocolate balls. Here are some recipes for macadamia nuts that you can follow. Macadamia nuts help promote strong, healthy hair and skin. Macadamia nuts prevent certain types of cancers. Macadamia nuts keep the heart healthy. Macadamia nuts provide relief for arthritis. Macadamia nuts fight free radicals to keep the body resistant against diseases. Macadamia nuts boost memory power. 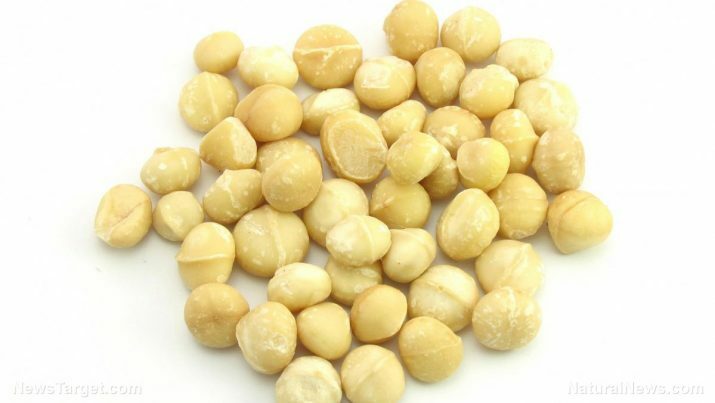 Macadamia nuts strengthen bones and stave off osteoporosis. Macadamia nuts are an average antioxidant.